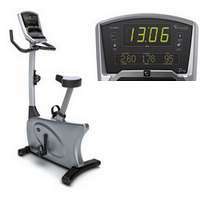 The U20 Classic is a sturdy upright bike with high-quality components for maximum performance and durability. Our friction-free magnetic resistance system and a heavy flywheel deliver a smooth and reliable workout. The Comfort Arc seat and multi-position handgrips provide a comfortable workout position. A large, easy-to-read LED display offers five preset programs to help get you started on your workouts right away. When space is at a premium, the U20 with its compact footprint, multiposition handgrips and adjustable seat is a smart choice. 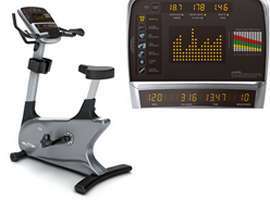 Pair it with the all-new Elegant+ touchscreen console for innovative features like our exclusive ViaFit system that automatically tracks your exercise data and shares it with your favorite fitness apps and social networks. When you are time-strapped, you will love the Sprint 8 High Intensity Interval Workout that gets you fit in just three 20-minute workouts per week. 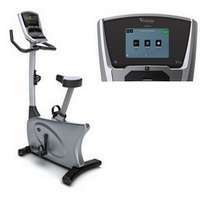 The U40 Classic is a top-of-the-line upright bike built to last. It uses our E.C.B Plus magnetic resistance system and an 11-kg/ 24-lb. flywheel for the smoothest possible ride. The Comfort Arc seat and multi-position handgrips provide a comfortable workout position. A large easy-to-read LED display offers five preset programs to help get you started on your workouts right away. 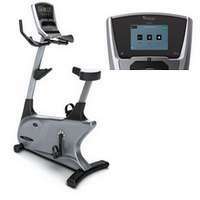 Get an outdoor ride on an indoor upright cycle. The magnetic resistance and heavy-duty flywheel deliver a smooth pedal stroke, and the multi-position handgrips and adjustable seat ensure a comfortable workout. Pair it with the all-new Elegant+ touchscreen console for innovative features that make your workouts more effective. Our exclusive ViaFit system automatically tracks your exercise data and shares it with your favorite fitness apps and social networks. 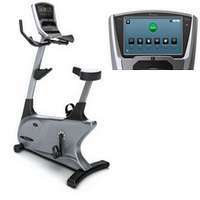 The magnetic resistance and heavy-duty flywheel deliver a smooth pedal stroke, and the multi-position handgrips and adjustable seat ensure a comfortable workout. When you add the top-of-the-line high-definition Touch+ console, you also get a large display and the best in entertainment and programming. Youâ€™ll also appreciate the convenience of ViaFit, which automatically tracks your workouts and shares them with your favorite fitness apps and social networks. The R20 Classic offers a step-thru recumbent frame design for easy access to the seated position. The Comfort Arc seat with lumbar support provides just the right amount of support and cushioning for an effective workout. A large easy-to-read LED display offers five preset programs to help you get started on your workouts right away. 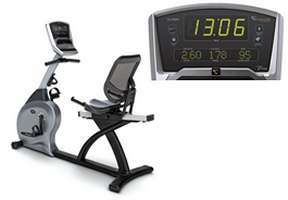 Our recumbent exercise bike with a step-through frame and breathable mesh seatback. Pair it with the Elegant+ touchscreen console for innovative features that make your workouts more effective. Our exclusive ViaFit system automatically tracks your exercise data and shares it with your favorite fitness apps and social networks, while the science-based Sprint 8 High Intensity Interval Training workout gets you fit in just three 20-minute workouts per week. 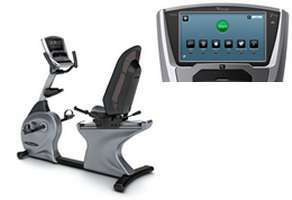 Our top-of-the-line R40 recumbent bike features a heavy-gauge step-thru frame that allows easy access to the seat. The ideal gear-pulley ratio and a heavy 11-kg/ 24-lb. flywheel provide a smooth and quiet ride. The breathable Comfort Arc reclining mesh seat will keep you cool and comfortable. A large, easy-to-read LED display offers five preset programs to help you get started on your workouts right away. Quiet, smooth ride, our top-of-the-line recumbent bike with a step-through frame and reclining mesh seat with lumbar support. 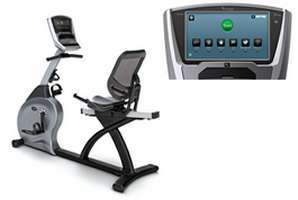 Pair it with the all-new Elegant+ touchscreen console for innovative features that make your workouts more effective. Our exclusive ViaFit system automatically tracks your exercise data and shares it with your favorite fitness apps and social networks, while the science-based Sprint 8 High Intensity Interval Training workout gets you fit in just three 20-minute workouts per week. Our top-of-the-line recumbent bike with a step-through frame has a reclining mesh seat with lumbar support to make your workout as comfortable as it is effective. When you add the top-of-the-line Touch+ console, you also get the best in high-definition entertainment on the large, clear console. You will appreciate the innovative programming, like the science-based Sprint 8 High Intensity Interval Training workout that requires just sixty minutes a week. And calorie counting is easy thanks to ViaFit. The R70 was designed with user comfort and convenience in mind. Step-thru entry allows easy access to the workout position, while the Club Comfort Arc seat with adjustable lumbar support keeps users comfortable. The remote toggle controls allow for easy adjustments to programming without letting go of the contact heart grips. The two-stage generator system allows you to place this bike anywhere in your facility. Designed for commercial settings, the U70 offers an extra-heavy steel frame and top-quality components to withstand hours of use per day. The motivating console with oversized LED display features 17 programming options, including the exclusive Sprint 8 program, for a multitude of workout options. In addition, the Club Comfort Arc seat, ratcheting chrome-plated seat post and conveniently located accessory tray make the U70 the perfect bike for your facility. 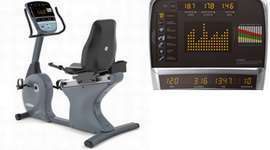 Arizona Extreme Fitness will deliver and setup your favorite quality Vision Fitness Recumbent and Upright Bikes in Prescott, Flagstaff, Sedona and Phoenix, Arizona at your location! Come on in and browse our 3000 sq ft warehouse showroom in Prescott Valley, Arizona and try before you buy or if you already know what you want just call us for our best price and we will deliver or ship it to you depending on your location in the USA. We sell, deliver, setup, install and service the above quality brand Vision Fitness Recumbent and Upright Bikes.